Birding parks in big cities are often a stopgap in between two family arrangements. But parks are often good for excellent surprises. Berlin should result in a great place to combine a city trip with a birding excursion. I started from the flat of a friend at Prenzlauer Berg. Soon we arrived at a subway (U-Bahn) station at street level. We bought a U-bahn ticket for the westbound trip to Sophie-Charlotte Platz from where it is a short walk along Schlossstrasse to the Charlottenburg Palace. 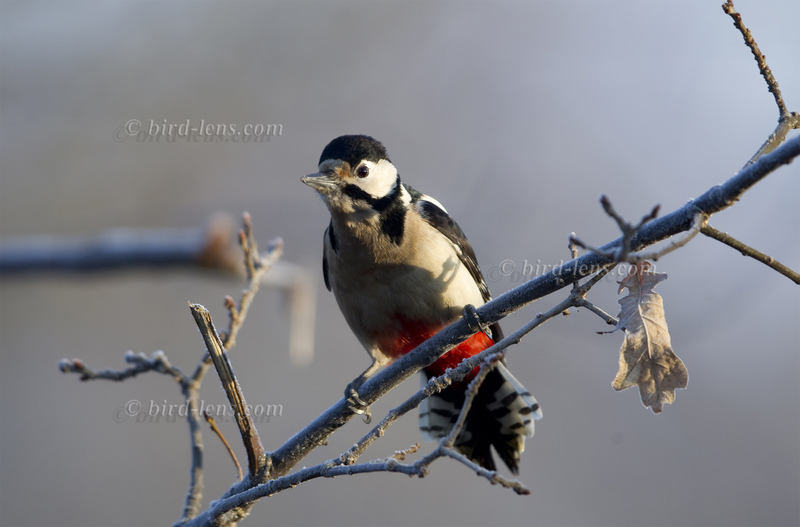 We had been told that the extensive gardens here are home to a pair of Middle-spotted Woodpeckers (Dendrocopos medius), a species that we had seen only once previously. The huge park is said to be full of gorgeous flowers and birds. It must be very nice to walk along the streams in the shade of huge trees. Unfortunately it rained and we decided to wait a while. After some hours, the weather hadn’t improved much from the day before but the forecast was for a slight improvement so we put on out waterproofs and put up with it. Birdwatching aside, the palace is worth a visit for anyone with time in Berlin. Construction of the palace was started at the end of the 17th century and it was built for Sophie Charlotte, wife of Frederick III the King of Brandenburg. It was built in the baroque style and burned to the ground during World War II. So what we see today is a reconstruction. The interior contains an art gallery but the gardens is open to all without any charge. The main gardens are behind the palace as approached from the Sophie-Charlotte Platz station and are very attractive. The area nearest the palace is formal with lawns and structured hedges whilst the more distant parts are a little wilder with tall trees and ornamental lakes. A nice place to look is following the most-western trail and passing the hospital, the Schlosspark-Klinik. From here, there is only a short walk to the Mausoleum im Schlosspark, which is surrounded by a nice artificial landscape with ponds. When we visited the park, the rain continued as we wandered around. Birds were quite active, mainly common woodland species. We found a couple of Woodpeckers that got a fair amount of scrutiny but they were the much common Great-spotted Woodpecker (Dendrocopos mayor). At the far end of the garden, away from the palace is a railway line and the railway bridge also carries a footbridge over the nice river Spree. We took this because we fancied a few minutes out of the rain and thought we might find a cafe over the other side. There was one within a hundred metres or so, the Cafe am Belvedere. The café is located in the Tegeler Weg. We ordered coffees and a piece of a very tempting chocolate cake which was even better than it looked, although incredibly rich which meant that we didn’t quite manage to finish it. The rain had almost stopped when we went back outside so we returned to the park where the birds were more active and in greater numbers. Over by the mausoleum my companion decided that a big bird in the top of a tall tree looked quite different and through the binoculars we could see that it was actually a Northern Goshawk (Accipter gentilis). The tree was taller than I thought. There’s a pair that breeds in the park so it might just be a good place to go to see what in the UK at least is a rather elusive species. Nearer to the palace we saw a few non-descript birds sitting motionless in the trees. We checked these out as well and found six Hawfinches (Coccothraustes coccothraustes), another species that is supposed to be quite common in Germany but often tricky to see in the UK. Almost leaving the park, a small raptor could be seen flying without great haste in canopy height: an Eurasian Sparrowhawk (Accipiter nisus) which was an excellent finish for that birding excursion. Berlin, the capital of Germany is a top tourist destination. Berlin might not sound like a birdwatcher’s paradise but, Berlin offers surprisingly good birding. So it a great place to combine a city trip with a birding excursion. Many airlines use the Airport of Berlin, but it is possible to take a flight to Frankfurt/ Main as well and drive with a rented car in roughly half a day. If you have spare time between two tourist attractions, are fed-up with the museum in crowdy downtown Berlin, have enjoyed nightlife extensively and are a birdwatcher, you might be interested to know, where you can find good places to enjoy fresh air and relax with birding for typical European birds. One of these sites is the Charlottenburg Palace mentioned above. Another good site is the lake of Guelpe (or Gülpe), the Guelper See in the west of the State of Brandenburg. 40-50,000 White-fronted Geese (Anser albifrons) and Bean Geese (Anser fabalis) occur in the winter and it is a good site for wintering duck and raptors and for migrating Common Cranes (Grus grus) and waders.